My family and I did a fun little run last night sponsored by a local athletic store. Myself, both of my daughters and my daughters boyfriend paid $5 each to participate in the run, a portion of that money goes to a local charity and we got a free beer and a “Run to Live Lager” pint glass to take home. My husband came along to show his support and afterwards we had a nice dinner at the pub. 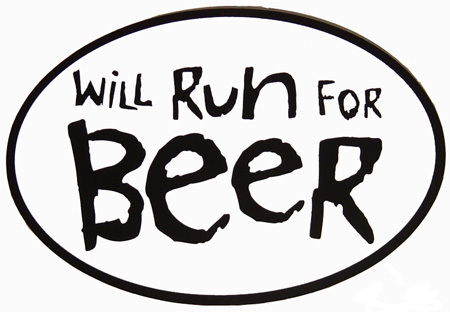 The store sponsors these about once a month and we have agreed to get out there and run for beer each month. Fun night out that can count as a workout for me! Got to thinking this morning about why I do it, why I have started running and why I continue to do it. Last night I did not really run for the beer, I actually ended up having one of their custom crafted sodas, I ran to have fun with my family and to push myself to do something I had not done before. In addition I hope to be a better fitness role model for my daughters. My daughters are in their 20s while they were growing up I was not exactly a physical fitness role model and in turn did not teach them many good ways to take care of themselves. I am hoping that fun things like last night, and the 5K we are doing this weekend and of course the Princess Half we are doing will help change that! They are smart young ladies and can take care of themselves but our work as parents never really ends. Besides they are awesome to hang out with and we generally laugh ourselves silly when we are together. So, why am I doing what I am doing? Why am I taking this journey and changing my life? I am doing it for me, I am doing it to experience something new, I am doing it because I thoroughly enjoy it, I am doing it to feel better, AND I am doing it for my family. If I get to have a lot of fun along the way that is all the better! Posted on August 24, 2012 by elizagal •	This entry was posted in Health, Motivation, Weight Loss and tagged Disney Princess Half Marathon, Health, lifetime journey, mental-health, running, Weight loss. Bookmark the permalink. I wish we had a Run for Beer here!